NSTRUMENTS for the measurement of audio frequencies are usually based on one of the numerous bridge circuits in which frequency enters explicitly. The familiar tuned-cir-cuit wavemeter has not made a satisfactory audio-frequency meter because of the large amount of power lost in it when the usual current indicator is used. 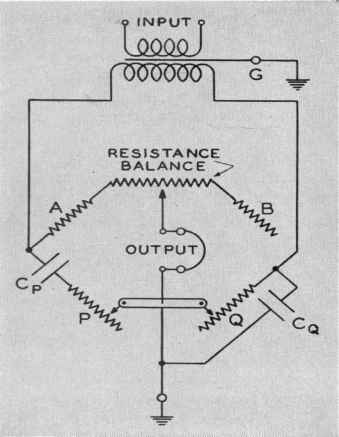 The resonance bridge makes use of a similar tuned circuit in one arm, the other arms being pure resistance. For any reasonable values of inductance the capacitance required to tune to the lower audio frequencies is so large that an air condenser cannot be used. The capacitance then is fixed and the inductance made variable in order to have continuous adjustment. Different ranges are obtained by changing the capacitance. The bridges of Campbell and of lvennelly and Velander make use of a v ariable mutual inductor and a number of fixed condensers. Bridges using inductance, either self or mutual, have two serious defects. The shape of the frequency scale depends upon the characteristics of the variable inductor used and cannot be appreciably altered. The magnetic field of the inductor is such that it cannot be satisfactorily shielded from the source of frequency being measured. The two resistors P and Q are wound on tapered cards of such a shape that the frequency scale is logarithmic. Equal frequency ratios occupy equal intervals on the scale. Hence the fractional accuracy of reading is constant. There are fixed resistors in series with the variable parts of P and Q having about one-tenth the value of the variable resistor, which limit the range of the frequency scale to a ratio of ten to one. The three frequency ranges, differ -ing by factors of ten from one another, are obtained by the use of three sets of condensers Cr and CQ, which also differ by factors of ten. The same engraved scale is used for all three ranges. The frequency ranges chosen are 20 to 200, 200 to 2000, and 2000 to 20,000 cycles per second. It is impracticable to keep the resistors P and Q and the condensers CP anil Cq exactly equal as demanded by equation (2). An auxiliary control consisting of a small potentiometer is provided between the ratio arms A and B to whose sliding contact the null detector is connected. This alters the effective ratio A/B and satisfies equation (1). If this adjustment is not made, however, the setting of the frequency dial is not altered but merely dulled. The null detector most often used for setting the frequency dial is a pair of head telephones. These are satisfactory in the frequency range from 300 to 5000 cycles per second. If the source of frequency to be measured contains harmonics, they will not be balanced out by the bridge and will be impressed on the telephone. The human ear can discriminate against a considerable amount of harmonic content. It must be aided by the use of a low-pass filler connected between the bridge and the telephones for high harmonic content or for the measurement of frequencies less than half the natural frequency of the telephones. When the voltage available to be applierl to the bridge is small, an amplifier must be used to obtain sufficient sensitivity. The General Radio Type 514-A Amplifier is exactly suited for this purpose because it maintains its voltage gain of 200 approximately constant from 20 to 20.000 cycles per second. used. The Type 488 Alternating-Current Voltmeters are well suited to this use. A suitable low-pass filter should be used because the alternating-current voltmeter lacks the power of discriminating against harmonics. The frequency dial is hand calibrated to an accuracy of 0.5%. It may he set to an accuracy of 0.1% w hen sufficient amplification is provided, this figure being determined by the spacing of the individual wires oil the variable resistors P and Q. The Type 434-B Audio-Frequency Meter will measure any frequency from 20 to 20,000 cycles per second. The usual sources are vacuum-tube oscillators of all kinds, tuning forks, and the lower range of magnetostriction rods. The meter is equally suitable for measuring the frequency of the beat note obtained from two high frequency oscillators. An accuracy of 0.5% in the determination of this heat note means that the difference between the two high frequencies is known to 0.1 cps for a 20-cps beat and proportionally for higher frequencies. When an unknown high frequency is compared with a standard crystal oscillator there are usually available harmonics spaced 1000 cps apart. The beat note can then always be made less than 1000 cps so that the unknown frequency is measured in terms of the standard crystal to within 5 cps. hile the copper-oxide rectifier type of voltmeter, which can be made in a portable form with a full-scale deflection of 2 volts and with an impedance of the order of 10,000 ohms per volt, is a very convenient and useful instrument for many alternating-current measurements, it has, unfortunately, two disadvantages in that its impedance varies with the applied voltage and that its calibration error increases with the frequency. For making measurements of small voltages in circuits of high impedance, —as, for instance, in measuring the gain at various points in amplifying systems-—Tor all voltage measurements al high audio, supersonic, and radio frequencies, and for tests upon resonant circuits, the thermionic or vacuum-tube voltmeter is much to be preferred and may, in fact, be indispensable. The accompanying illustration shows the new alternating-current-operated thermionic voltmeter being used to measure frequency response curves of tuned interstage transformers intended for operation at high audio frequencies. ent-day desire for more convenient equipment energized solely by a 110-volt 60-cycIe circuit and to supply a meter which shall be reliable at radio frequencies, the Type 626-A Vacuum-Tube Voltmeter is now offered to the experimenter. This instrument is a rugged, serviceable, direct-reading, moderately-priced meter of the compensated, depressed-zero type, having a full-scale deflection of 3 volts, r.m.s. From 0.5 volt to 3.0 volts the scale is approximately uniform. The filaments of the 227-type tube (thermionic voltmeter) and the 171 -type tube (rectifier) used are run at subnormal voltages so that their normal life is considerably increased. Proper circuit design minimizes the wandering of the zero or aging. By incorporating an 874-type ballast tube, the chief source of error, fluctuation in line voltage, is reduced to only .05% of full scale value per volt change. A rheostat is provided for compensating a change in line voltage over a range from 100 to 120 volts. Due to the large thermal capacity of the cathode of the 227-type tube, small erratic changes in line voltage are ordinarily negligible. These meters are individually calibrated to within 1% of full-scale value. Below 1500 kilocycles, the frequency error is negligible. At 3000 kilocycles, it is less than 2%, and at 4000 kilocycles, less than 4%. The input impedance is constant and approximately 10 megohms and no external direct-current path is required. Housed in a walnut cabinet 11 inches long by 8}-^ inches square, this instrument weighs fourteen pounds. The price, complete with tubes and attachment cord, is $100.00 and the code word is ethic. Development work has recently been completed on an instrument which has a wide field of usefulness in the testing of apparatus for the electrical transmission or reproduction of speech, music, or vision. The new instrument, the Type 536-A Distortion-Factor Meter, will measure the harmonic distortion in the modulated output of a broadcast transmitter. It can then determine how much of the distortion is due to the speech amplifiers. In a receiving set it can measure the harmonic distortion produced in the detector or in the audio amplifiers. By its means, also, measurements can quickly be made which will determine what load resistance should be used with a pentode output tube to obtain the maximum power output for various allowable distortion limits. 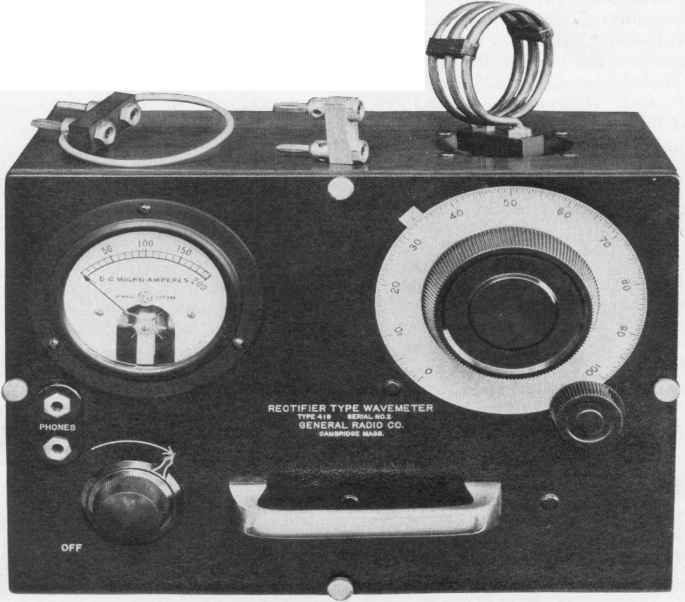 The distortion-factor meter was developed so that distortion measurements could be accurately made by a very much simplified technique. After a preliminary observation, the total harmonic distortion is given directly by a dial reading. Less than thirty seconds is required for the entire measurement. equal. 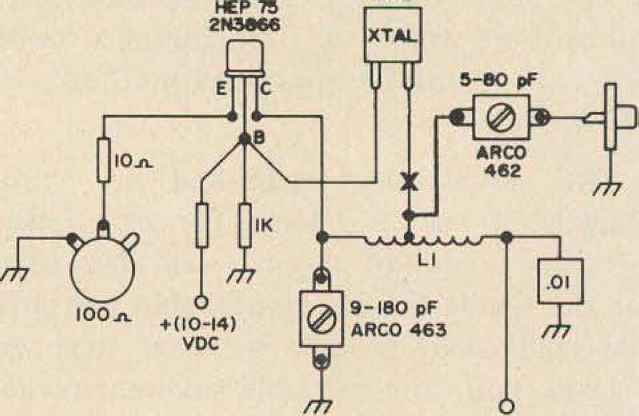 A dial, attached to the voltage divider, then reads directly I lie harmonic content. The distortion-factor meter is not to he confused with a harmonic analyser. This latter instrument is a sharply selective device which will measure the amplitudes of the various components of a complex current or voltage wave. It is very laborious to use a harmonic analyser for distortion measurements. A separate measurement must be made for each harmonic present, and the results combined to obtain a useful result. The distortion-factor meter, on the other hand, is designed so that one of the filters transmits equally all the harmonics, while suppressing the fundamental and any power-supply hum which may be present. If a root-mean-square indicating instrument is employed, therefore, the reading obtained with the distortion-factor meter will give directly the desired ratio of the effective value of the combined harmonics to the value of the fundamental. No computation whatever is required. Let us consider in more detail one of the applications of the instrument, the testing of broadcast transmitters. As the distortion-factor meter is designed for testing at 400 cps, a fairly pure voltage source of this frequency must lie available. With most oscillators, a filter must be employed to obtain sufficient purity. The filtered oscillator output is applied to the input of the speech amplifiers. Layout for measuring distortion present in the output of a broadcast transmitter meter. The complete layout is indicated in lhe figure. It is believed that this measurement of modulation distortion is the final index of the quality of the output of a broadcast transmitter, as far as harmonic distortion is concerned. It lumps together all the sources of harmonic distortion in the transmitter and measures their combined effect on the shape of the output voltage wave. 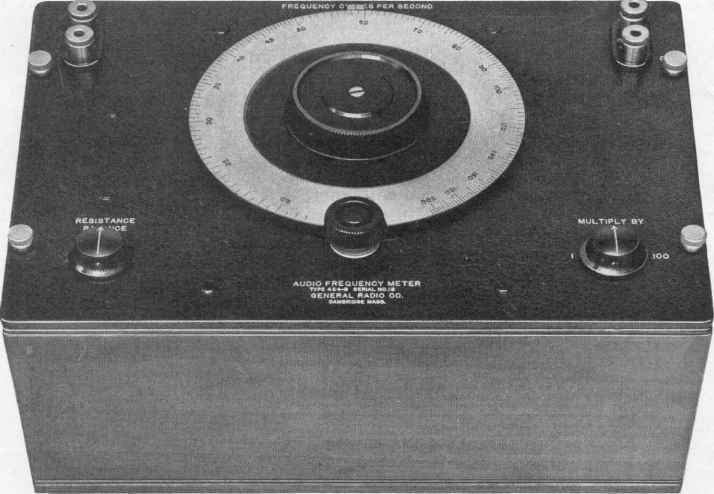 This discussion of the application of the distortion-factor meter to the single problem of the testing of broadcast transmitters will serve as an indication of its many uses in electric communication technique. The price of the Type 536-A Distortion-Factor Meter is $140.00. Type 119-A Wavemeter service use where a rapid and fairly accurate measurement is required. In this way, inaccurate and bothersome Lecher wires are eliminated where wave lengths are measured with a yardstick. Stable oscillators have made it possible to use heterodyne methods even at 1 meter and to calibrate the Type 419-A Rectifier-Type Wave-meter in terms of the General Radio primary standard of frequency. Besides measuring oscillators, transmitters, and receivers, the instrument can be used as an aural detector of modulated oscillations and as an un-calibrated vacuum-tube voltmeter. 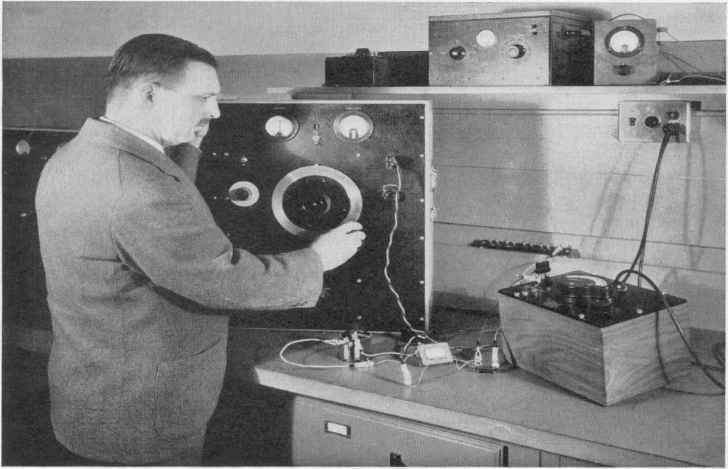 The accompanying photograph shows the instrument. Dimensions and weight of the cabinet have been reduced as much as possible and a handle is provided 011 the panel. This way it is possible to hold the instrument with one hand and bring it in any desired position with respect to the apparatus which is to be measured. The Type 102-L Decade Resistance Box is a four-dial box, having a maxi quency ratio of 1:2, cover the entire range of the wavemeter. A large dial makes it possible to read settings to within 0.1%. With respect to errors that are likely to occur due to the presence of metal parts in the field of the inductor and "transformer action," the accuracy has been conservatively set at 1%. As an indicating device a vacuum-tube voltmeter is used, the high sensitivity of which is very advantageous, since it makes it possible to use a very loose coupling between ihe wavemeter and the apparatus under measurement. Besides the permanently connected indicating instrument, plugs are provided for the connection of headphones. The cabinet of the wavemeter contains the four plug-in inductors and four separate calibration charts. The calibration is given in terms of frequency, but 011 each chart a conversion curve is provided which makes it possible to read in wave length as well. The price of this meter is $100. —Edu vrd Karplus mum resistance of 111,100 ohms, adjustable in steps of 10.0 ohms; the Type 102-M Decade-Resistance Box has five dials with a maximum resistance of 111,110 ohms in steps of 1 ohm; anil the Type 102-N Decade-Resistance Box is a five-dial box with a maximum resistance of 111,111.0, adjustable in steps of 0.1 ohm.